Below is our, as computer repair Southampton specialist advice on how to take advantage of Windows 10 free upgrade, before it ends. But time is running out so read below and book an appointment before you miss out on this opportunity! 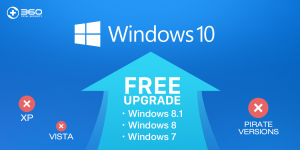 Windows 10 is approaching its end for a free upgrade, after this point in order to upgrade you will need to pay. Therefore if you have Windows 7 or 8 on your computer we recommend that you bring it into iFix Computers repair store in Southampton, to upgrade it before the 29th July 2016. Windows 10 brought us new features and even a modern start menu, something Windows 8 lacked. The sleek design of Windows 10, makes it easy and simple to use for all different kinds of users. To install it, it involves removing all your files and data from your hard drive and starting anew. With this in mind I would recommend that you backup all of your files and then bring it into the store as this will save you money. We are dedicated computer repair in Southampton, and understand more than most the importance of your data and files. With this in mind, once you’ve backed up your computer you will only need to pay £49 for a service called System Reset and Restore, otherwise you will also have to pay £35 for the service called Data Backup and Transfer. Just to reiterate, I would highly recommend upgrading to Windows 10 whilst you have the chance as this will be the most up to date and secure version of Windows out there. Call 07805 513320 or talk to us on a live chat to book a time slot ASAP!